Nehemiah wrote, “While we were working on the wall the people approached me begging that I fix a problem that had been going on for some time. The people had been heavily taxed by the Persians and there had been a famine. In order to pay their taxes and survive they mortgaged their vineyards and farms to fellow Jews. They even sold their children as slaves. Their fellow Jews charged them interest on the money they lent them for their farms. The people were getting poorer and poorer and they begged me to help. I confronted the leaders and told them to give back the vineyards and farms and to treat their fellow Jews like family and to be benevolent toward them. The leaders listened and gave back their vineyards and farms and quit charging interest. I was benevolent as I could be and did not demand that I be treated as extravagantly as other Persian governors expected. I pray that God remembers me for me generosity.” – Nehemiah 5 paraphrased. It’s so easy to try to take advantage of other people’s misfortune and to make sure I have what I need while being careless with theirs. 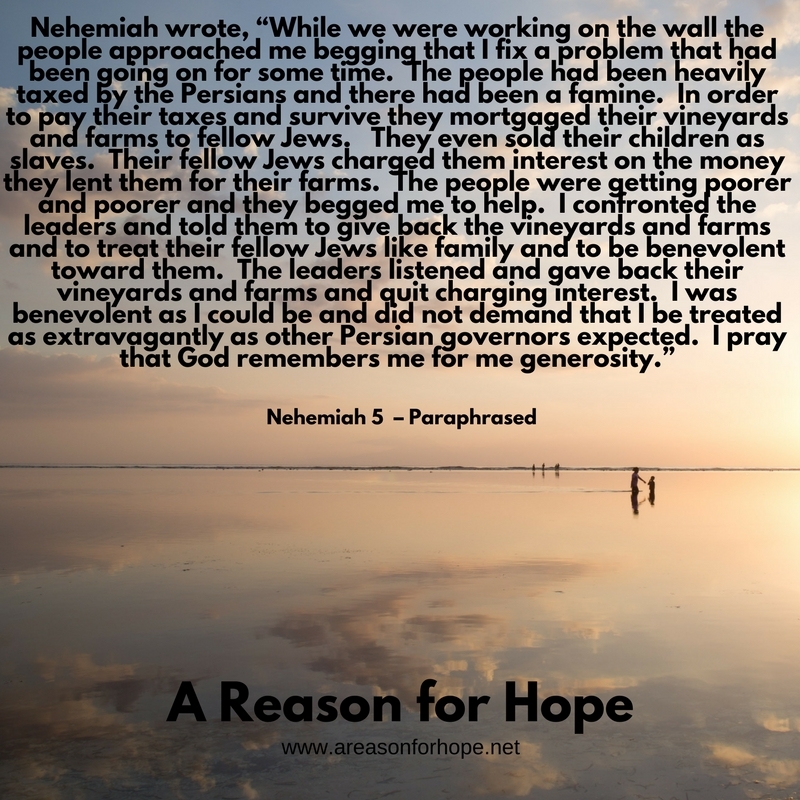 Nehemiah demonstrated a truly benevolent and selfless heart. He lifted burdens and protected people’s property. Give me the same leadership that makes me lead my own soul away from materialism and the exploitation of others. Help me to defend the rights of the underdog and to relieve suffering wherever I am able. Give me eyes to see their needs, ears to listen to their complaints, hands to help them and a tongue to speak in their behalf to others. Make me a good and generous leader like you are. You lead yourself to give your Son for me. Lead me to give up precious things for others too. When a person denies themselves the easy profit from others plight, you know God is at work in their soul.